Asuka is the Second Child ('Second Children' in the Japanese versions of NGE), who pilots Evangelion Unit 02. She is from Germany, but with an American father and a half-German, half-Japanese mother. 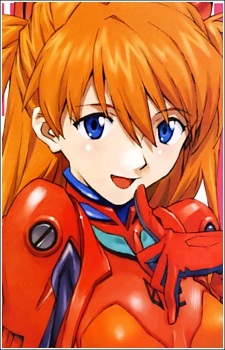 In the Rebuild of Evangelion series of movies, her name is changed to Asuka Langley Shikinami. Her mother, Kyoko Zeppelin Souryuu, went insane after an Eva-related experiment and began to believe that a doll that resembled Asuka was, in fact, her daughter, to the point that she refused to acknowledge the real Asuka. Kyoko Zeppelin Souryuu committed suicide on the very day that Asuka was chosen to become an Eva pilot. On that day, Asuka promised herself that she would never cry again. This event gives her an innate hatred of dolls and all things that she perceives to be doll-like, especially Rei. Despite those feelings Asuka shows no hesitation when required to cooperate with Rei when necessary, proving her to be committed and professional regarding her duties as an Eva pilot.